It’s not uncommon for us to hear that a man’s duty is to start a family, raise, protect and love them, providing for them all their needs. Same way, we hear that a woman’s duty is to love, nurture and care for her family. But am curious, is that all being a MAN or WOMAN is about?? What’s your purpose on earth first as a human being? Introducing you to Project “About Being A Man”. Oh yes I know, am a woman, but am a curious one, hence my interest in this awesome project!! 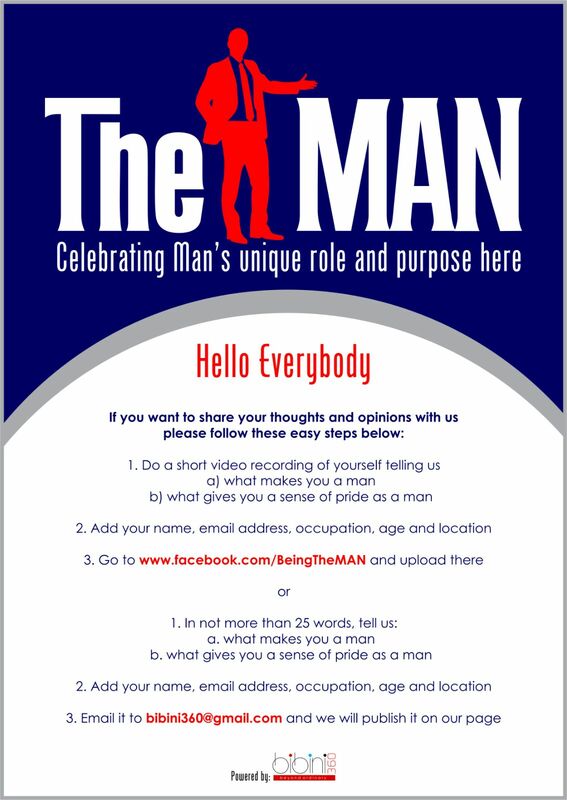 The MAN is a platform aimed at identifying, discussing and celebrating the purpose of man, his role in building the family unit and also shaping society. (Sounds Exciting). How about sharing your thoughts on this project… What do you think?? Have a beautiful Monday lovelies. I will, I would like to see what guys see their role as being. I too. Anyway…opening my mind all the way. Yes it does.. Always good to get another perspective… Am following their Facebook page…they uploading street interviews soon too. You should check out their page and spread the word to your male friends and curious females like me. Hehe.